The first set of weights Larry Williams owned was a broomstick and two concrete blocks. Now, he's set his second powerlifting world record and swept his first bodybuilding competition in the same three months. Long before he was the new face of powerlifting, world record holder Larry "Wheels" Williams was one of approximately 11,000 children living in foster care in New York City. From ages 7 to 12, he bounced among homes, after his mother lost custody of him. At first, he lived with his grandmother, but eventually he was spun fulltime into a system of strangers taking him in, then booting him out. At the age of 12, and no longer in school, Williams walked away from the boroughs of New York City and sought out his mother on the French Caribbean island of Saint Martin, where he lived seaside with her for the next three years. There were two options for school on Saint Martin, one with instruction taught entirely in French, and the private school full of English-speaking rich kids. Williams couldn't attend either, so he lived without an education, and with few friendships. Although he had his mother now, he felt boxed-in by the sea. "I lived right on the beach," he says in a thick, Bronx accent. "For an adult, it's a dream come true. But as a child, I couldn't drink or smoke now that I was living with my mom. And none of the kids in our area spoke my language. So, I literally had nothing to do except lift weights." He says he began pumping iron at age 14, but not with a rusted barbell and $100 worth of used plates and dumbbells, the way a lot of kids start. Williams began with only a broomstick accompanied by two cinder blocks, one on each end. "I made it work," he tells me, laughing like a guy you'd grab a slice with at the pizzeria. He seems funny. He doesn't seem hurt by his impoverished past. "I did biceps curls. And I could bench with the same bar." "The Internet over there was dial-up," he says. "It was slow, so I couldn't really unwind in my room. Instead, I'd go ride my bike to tire myself out, come back home and work out, go tire myself out some more on the bike, then come home again and sleep." This went on for a year. He could feel himself getting bigger, stronger, and more functional in the physical spaces he inhabited. Having essentially dropped out of school in the eighth grade, the most basic exercises—born of concrete, stick, and the spinning of two wheels—were his educators now. At 15 years old, Williams wanted to join a gym, but wasn't allowed to. The minimum age of gym entry on Saint Martin was 16. At the same time, his mother, waitressing to make ends meet, was ready for change. They'd been reunited for three years now, but the Caribbean wasn't home. Together, they moved back to the Bronx. Williams joined a gym almost immediately, working at a restaurant to pay for his membership. After a year of lifting weights, he knew two things: First, he was stronger than any grown man in his gym, and second, lifting would be his life. "Every now and then, I wonder how my life would have turned out if I'd had a regular mom and dad, a brother, a middle-class childhood full of choices," he says. "I think I would have been lost. The options would have been overwhelming." He pauses the conversation. Over the phone, he's waiting for me to ask him another question, but I'm thinking about my own life, instead. I wonder if my life has been like the one Williams hints at, middle-class and drifting. I am on the phone with the strongest man in the world—or in his weight class, anyway. At 270 pounds, he deadlifts 855, his bench is 610, and his squat is precisely 200 pounds more, at a flat 810. What focus must it take to move that kind of metal? And what, I wonder, in all of my life, have I moved that would equal this weight? "I guess I could have tried to be a firefighter or NYPD," Williams says. "But the way my life went, powerlifting and bodybuilding were the only things I had an edge in. So, I gave them everything I had." By the age of 18, Williams entered his first RPS Powerlifting meet. He weighed 247 pounds, but competed in the 275-pound weight class and won. He's been steadily winning, and setting records, since. In November of 2017, he competed in the 275-pound weight class and commandeered a raw, combined world record of 2,275 pounds, roughly the weight of two polar bears. Within three months of his powerlifting record, Williams had dropped his body weight to 259 pounds and competed in his first bodybuilding competition, the NPC Gold Coast Muscle Classic in California, in February of 2018. He won that, too. As a crossover from powerlifter to bodybuilder, Williams is a double-threat. And he's even more of a threat because, as he reiterates, "This is everything." And he means, just like when he was a kid, that there literally is nothing else. 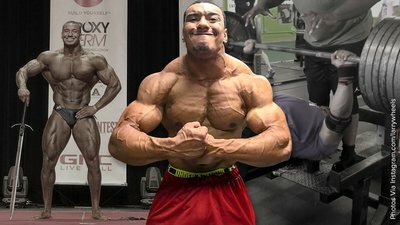 Right now, Williams trains six days a week—three days focused on powerlifting movements, and three on isolation work, doing reps to failure for his bodybuilding cut. Protein shakes nag at his stomach, so his calories and protein arrive the old-fashioned way: from food. He eats lean chicken and white rice six times a day. He might add barbecue sauce if he's "feeling it." A couple of times a week, he might have a steak and a sweet potato, but red meat gets expensive, whereas the chicken comes to him in bulk, from a friend hooking him up. On a regular basis, Williams also takes fish oil, pre-workout, and MHP's BCAA XL Energy, which he mixes into a five-gallon jug of water and drinks throughout the day. His minimalist diet leads to generally clean eating, but he's careful to dirty things up a little, too, so that his body has something to feed from. To stockpile the fats and carbs needed for burning, he supplements with peanut butter and jelly sandwiches and the occasional Pop Tart. For most of us, a part of growing up means contemplating extremes and anomalies. There is good and evil in the world, we are told. In lore, the wickedest can speak to snakes. Women with headscarves and a crystal ball will see into the future or convene with the dead. Beneath some seas, mermaids swim and sing. And here on land, the strongest man in the world is an object of fascination, revered, but ultimately considered to be fantastical, not real. Williams doesn't seem to have thought much about these things. Perhaps the ever-changing roof over his head and the mother in a distant land were the spokes of a wheel he clung to, revolving, like hanging from the side of a moving Ferris wheel in deep night. When it stopped, Williams somehow landed sure-footed, spot-lit by sunshine. I ask him what it's like to be a phenomenon, and he laughs. This is the laugh of one of the strongest in the world, I think. And then he tells me, "This is just a stopover. In the mind of a champion, there is never enough. I've broken two records, but I'm not even close to satisfied. On the Monday after my last world record, I was back in the gym." Later, stopped at a red light on my way home, I think about the comic books under my bed as a kid, and the lion tamers at the circus, and the astronauts on TV wearing bubble-shaped helmets. In the cars all around me, every driver is on a cell phone, and none of them look like the stuff of legend. Yet all of them, including myself, believed in that possibility, if only at first. And this is why the lore is created, to allow us something to believe in, something greater than ourselves to fight against or, in better scenarios, to work toward becoming: something magnificent, and otherworldly. We just rarely expect people to get there, is all. Williams hopes to set another powerlifting world record at the 2018 U.S. Open, in a third weight class. Additionally, he'll be going to the NPC National Bodybuilding Championships in Miami in November. And he's starting a clothing line, too. His goals are year-long. He doesn't do the five-year plan because too much happens from month to month, he says. And, like dozens of other successful people I've interviewed, he spends very little time dwelling on the past. "Right now," he says, "I spend every single day visualizing myself on the platform, squatting, benching, developing what's needed to take the record in May. When I'm not doing that, I'm thinking about my meals. Am I on track? That's what's on my mind. And visualizing myself with the award, with the metal around my neck." When I ask him what his mom thinks of his success, he confesses that she's not an aficionado of the sport. "She's just knows that I'm strong, and that I'm big," he says. And then he asks me, "What do you call that love that doesn't need anything in return?" Williams, in an accent like a Bronx fist-bump says to me, "That's all I need." I think about him going from lifting cinder blocks as a kid to polar bears as a man. For a guy from the system, he seems to have it all—both grit and love. And who among us, I wonder, needs anything else?